A new book by University of Notre Dame peace studies scholar and political scientist Daniel Philpott makes the case for forgiveness and reconciliation as a way to achieve justice and lasting peace after violent conflict. “Just and Unjust Peace: An Ethic of Political Reconciliation,” recently released by Oxford University Press, explores the concept of reconciliation, which is deeply rooted in Christianity, Judaism and Islam as well as in the secular restorative justice movement. “Under the leadership of Archbishop Desmond Tutu, a religious leader who reached into his own tradition to speak about reconciliation, many South Africans found healing through truth and reconciliation commissions that enabled them to tell their stories,” Philpott says. Philpott directs the Kroc Institute’s Religion and Reconciliation research program. His book is the second volume in the Oxford University Press’ “Studies in Strategic Peacebuilding” series, edited by R. Scott Appleby, John Paul Lederach and Philpott, all of Notre Dame’s Kroc Institute. The first volume in the series is “Strategies of Peace: Transforming Conflict in a Violent World,” by Daniel Philpott and Gerard F. Powers. “Daniel Philpott is quite simply the best at what he does, namely, bringing normative commitments and empirical sophistication to bear at the most vital issues of our day where religion and public life, both domestic and international, are concerned,” writes Jean Bethke Elshtain, the Laura Spelman Rockefeller Professor of Social and Political Ethics at the University of Chicago’s Divinity School. “Everything he writes deserves careful attention, and he is at his best in ‘Just and Unjust Peace.’"
“‘Just and Unjust Peace’ is easily the most thorough and vigorous defense presently available of the view that peacemaking, after a period of massive political injustice, should aim not just at punishing offenders but at that far more comprehensive state of affairs that Philpott calls ‘political reconciliation,’” writes Nicholas Wolterstorff, the Noah Porter Emeritus Professor of Philosophical Theology at Yale University. 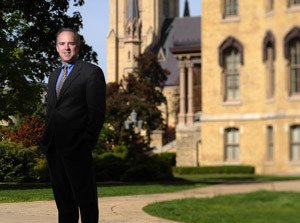 Originally published by Renée LaReau at newsinfo.nd.edu on August 23, 2012.